The Huawei P smart 2019 smartphone sits at the budget end of the Huawei range but with a big screen, dew drop notch, a decent battery and dual cameras, can this smartphone that's priced at under £200 impress? Let's find out. If you want to make a sensible choice when it comes to buying a smartphone, don't want to spend hundreds, or even thousands, on a device but still want decent specs, the Huawei P smart 2019 is well worth considering. Does it have the best camera? 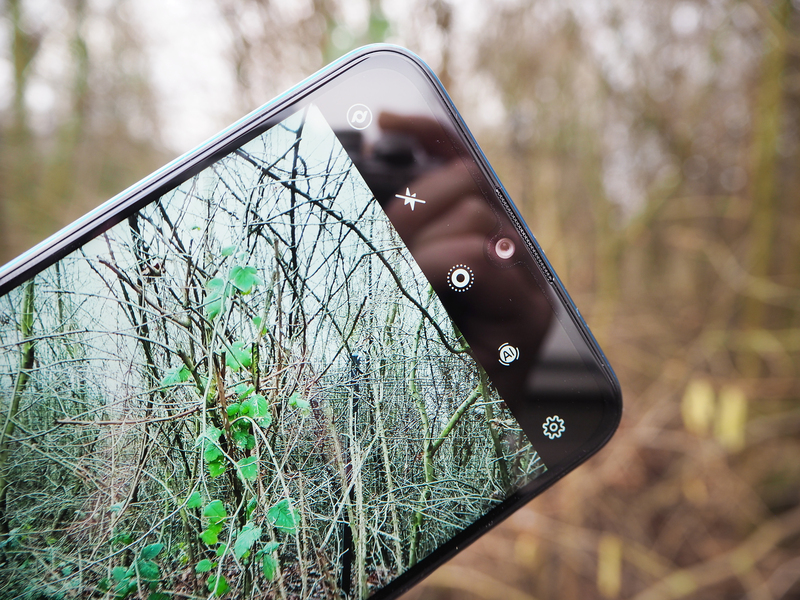 No, but it's not terrible by any means and it does lack some of the bells and whistles other smartphones have but, for under £200, we're sure you won't miss them too much. The Huawei P smart 2019 is an affordable, 'head overrules heart' smartphone and so long as you read the specs/features list before parting with your cash, you won't be disappointed. The Huawei P smart 2019 is a new budget-friendly smartphone from Huawei that's available for under £200! Considering the price point, you may think you'd be better off looking elsewhere but with improved cameras, a bigger screen and a much smaller front notch, similar to the one seen on the Honor 10 Lite, this money-saving smartphone has specs (on paper) that shouldn't be ignored. Shall we find out how it performs in real life? The new version of the Huawei P smart improves on last year's offering with a bigger screen (6.21-inch vs 5.65-inch), a better chipset (Kirin 710) and a much better battery (3400mAh) but the microUSB port is a little disappointing to see. Plus, you can't really miss the introduction of a dewdrop notch rather than the more familiar rectangular shape sitting at the top of the smartphone. As for the cameras, you get a 13MP f/1.8 rear camera (featuring phase detection autofocus) with a 2MP secondary camera for depth sensing, as well as an 8MP f/2.0 wide-aperture selfie camera which is a fixed focus lens. 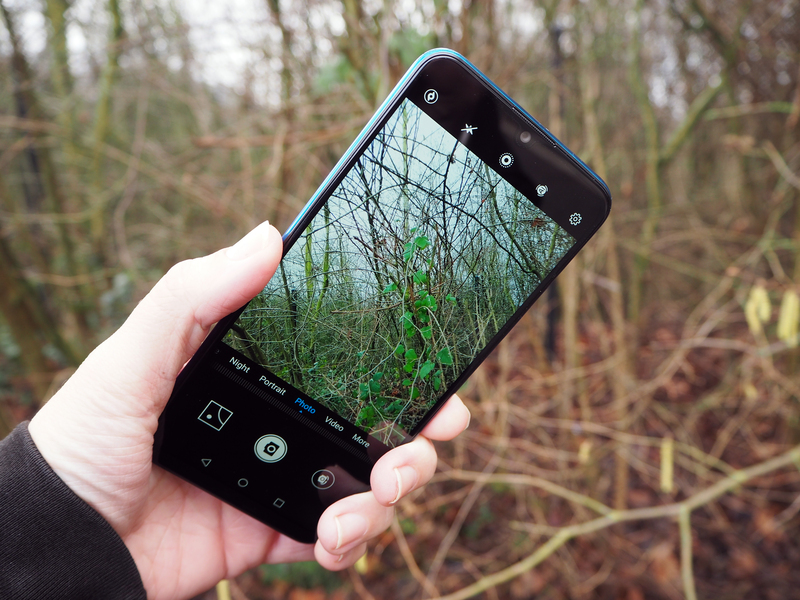 There are plenty of clever photography tricks built in including an aperture mode, portrait mode and a night mode - something we're seeing on a lot more reasonably priced smartphones. The Huawei P smart 2019 runs Android 9.0 Pie, has 3GB of RAM, 32/64GB storage options available and has a microSD slot for expanding the memory further. We have to mention the colour options, too, as they're actually really cool. You have Midnight Black, Aurora Blue, Sapphire Blue, and Coral Red. On test is the Aurora Blue option and its ombre effect that goes from light to dark blue is very eye-catching. The rest don't have this gradient effect but this doesn't stop them from looking cool. The price is the most impressive bit, coming in at under £200! Which, you have to admit, is a bargain price for a smartphone. When you first pick the Huawei P smart 2019 up, the first thing you will notice (apart from the colour) is probably how light it is and that's because it has a plastic back. By foregoing glass, Huawei probably saved money but it does mean it's more prone to collecting marks and scratches. 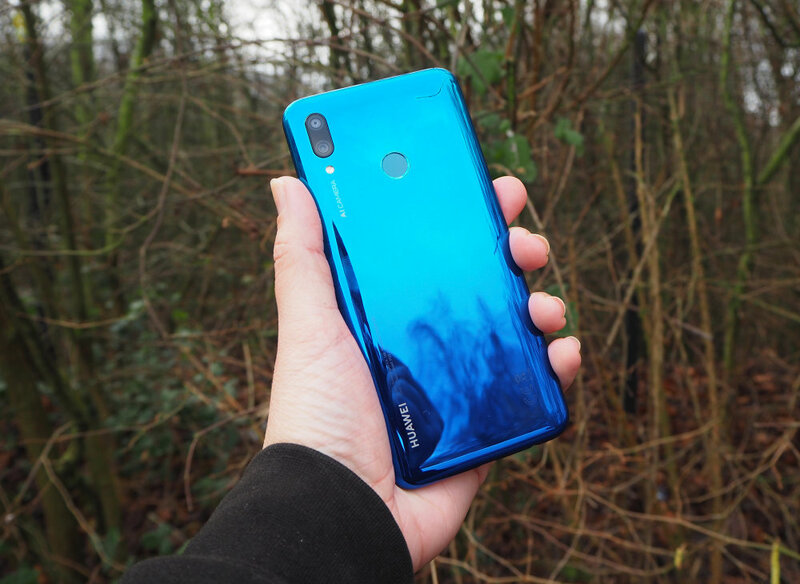 You don't get a clear case with the P smart 2019, as you do with other Huawei or Honor smartphones, either, so you will need to purchase one if you want to protect your device a little better. Some may think the lack of weight makes the device feel cheap and yes, of course, it feels 'plasticky' as it's a plastic phone but it doesn't feel like Huawei has skimped on quality when it comes to build. Edges and corners are nicely rounded and we've already commented on how great the Aurora Blue colour is - we like it a lot. Also on the back is a fingerprint sensor which sits in the perfect place for unlocking the device with your index finger along with the dual camera and flash. On the bottom of the smartphone, you find a speaker, mic, headphone jack (this will please some) and a microUSB port (not quite as pleasing). On top, there's another mic and the card slot for a microSD card (and nano-SIM). To the side are the usual volume/power buttons but it's the front where a big change has come as there's a dewdrop notch instead of the usual rectangular shape we're more familiar with. As a result, the 6.21-inch screen takes up most of the space on the front with minimal bezels surrounding it. There is a slightly bigger chin but with the technology built into these devices, there's no way of getting around this without adding a more expensive price tag. Hidden in the chin is an LED which shows you when the smartphone is charging and when you get a notification. The 6.21-inch, 2340x1080, 19.5:9 display is really nice, bright and doesn't cause any complaints. The smartphone, overall, also fits in the hand well and doesn't feel overly big. It won't easily slip out of your hand and can be navigated one-handed quite easily. As for the camera app, it's the same as you find in other Huawei smartphones and offers various creative features including a portrait mode, aperture mode, night mode, pro mode and more. A video mode is available but it only shoots up to 1080p FHD quality and there's no stabilisation which is a shame as some of the phone's competitors, such as the older Samsung Galaxy S5, do have 4K built in. Although, the dedicated night mode isn't something we see on many other budget smartphones so that's a big plus point. Battery: The battery is rated at 3400mAH and we had no issue with the battery after an afternoon of shooting photos and capturing video. The lack of a glass back means no wireless charging but hey, it's no biggy. For those who like numbers, the Geekbench score is 1371 single core and 5075 multi-core while the AnTuTu score is 120027, which is impressive for a budget smartphone.